I'm digressing a wee bit here again, but I feel it's well worth it. Today is my mom's birthday. I won't say her exact age as I think she wouldn't appreciate that much, but she's in her early seventies and doesn't look a day over 60. She's one of those super spry older women - out doing her own yardwork, gardening and canning, chairing committees at church, fixing random things around the house - that we all hope to be. It is in my mother's garden that I got my first taste of caring for the land. 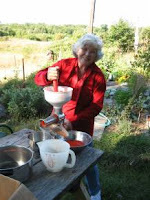 I remember planting corn with her using a rusty old hand plow, and being firmly told that I could NOT eat those seeds. (I must have tried or had that look on my face of wanting to try.) It was there I saw my first tomato hornworm, and watched while my mother threw it out of the garden to fend for itself. (I still practice this unless a really hungry looking chicken is walking by.) Here I met zinnias and cosmos and immediately fell in love. She introduced me to rhubarb, squash, potato plants, sweet peppers, marigolds, cucumbers, green beans, and homegrown tomatoes. She served thick slices of tomato, which we then sprkinkled with a bit of sugar to enhance the flavor. Cucumbers came out not just as some of the best pickles ever - dill and sweet slicers - but in little dishes with a touch of onion and either vinegar or cream. Green peppers got stuffed or sliced to be eaten like candy. (I don't actually like green peppers much, but I still eat them and immediately taste summer.) Corn came in on the cob, and turned into one of my most favorite things ever - corn relish. New potatoes bathed in butter disappeared so quickly they almost seemd a figment of our imagination. Larger potatoes with some of the creamy cucumber went down pretty easy, too. I won't say I was her best helper in the garden. I'm pretty sure I was the worst. I hated gardening then - hot, dirty, gross bugs, boring - but love it now. I wish I had paid more attention and been more patient while working with her. She might not admit it to me, but I'm pretty sure I got to go back inside because I was better at whining than assisting. It was not for a lack of effort on her part, and I give her due credit for trying. I believe that much of what is best about me is from her. As we all are, I was raised and influenced by a number of people - family and friends - but it is my mother who instilled in me a firm belief in helping others, to be kind and civil in the face of adversity, to believe in myself, and that homemade is best. These all sound rather trite, but I have found them sound guiding principles as I move through life. You could say she planted those seeds in me (and my brothers) long ago, and has tended them ever since with patience and love. It is her example I try to live up to and learn from to this day. I'm not there yet, but I'm so very glad to celebrate her today and the gift she is to us. Happy Birthday, Mom!